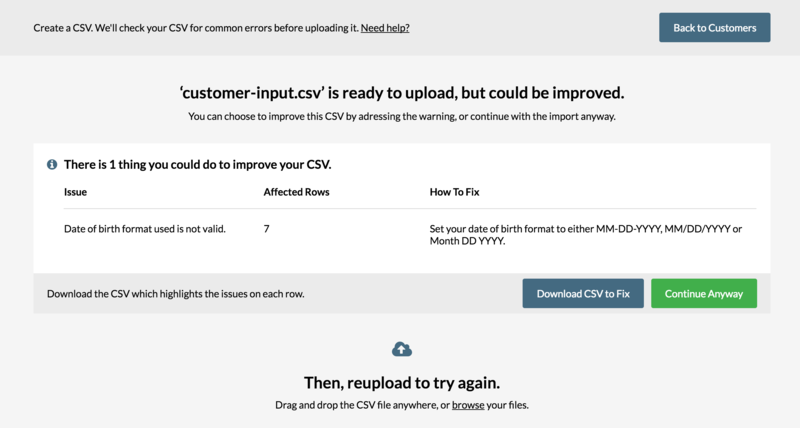 Importing Customers in a CSV file – How can we help? When setting up a new Vend system, customers can easily be imported as a CSV file. This means you can transfer customers from an existing system (such as MYOB, Outlook or Sharepoint), by exporting them from that system as a spreadsheet or CSV, renaming the columns to match Vend, then importing the CSV file directly into Vend. For information about importing customer loyalty balance's check out this article here. If you are using MYOB, Outlook, Sharepoint or another system, you'll need to export your customers to a universal format that you can work with, such as an Excel spreadsheet or CSV file. If you are on a trial system, we recommend adding one or two test people to Vend manually, completing all the fields, which will populate your export file. On the Customers page, click Export List, which will download any existing customers as a CSV. Important: Some of these customer fields are generated by sales activity in Vend and cannot be 'imported' through the CSV file, including YTD Balance and Loyalty Points. Once you have created your Vend customer CSV, you'll need to import it into your store. Vend's CSV checker will look for some of the most common import errors in your CSV file before it imports into your store. Now, when you choose to import or update customers using a CSV, your CSV will be put through our system so that Vend can run a quick check on your CSV file. It will check for any formatting issues or errors such as column headings and mandatory fields and let you know if any of these errors are present in your CSV file. 1. Click the Import Customers -> Import with CSV. 2. On the Import Customers page, upload a CSV by either dragging and dropping your CSV file or click browse to search for and add the CSV file. 3. As soon as you place your CSV file here, Vend will immediately perform a quick error check. If the validation is successful move straight onto step 6, if Vend detects any errors, you will be taken to the error screen below. 4. At this stage, you'll be able to review the cause of this error and download a new version of your CSV that includes notes of what to fix. 5. Once you've made any changes, remove any error notes from the CSV and reimport the file by either dragging and dropping it into the window or browsing for files again. 6. Once successful, you will be taken to a confirmation screen. From here, click continue import to import the customers into your store. You may also receive warnings before importing. If your CSV contains an incorrectly formatted date of birth for example, you may receive a warning message. If you receive a warning message you can still proceed with the import but we recommend you make a note of the warnings you receive and fix them if necessary. If you see the screen below, the contents of the file you have tried to import may not be separated correctly. The best way to fix this up is to export an existing customer from Vend as a CSV and make sure you are following the same format in your new CSV. To find these steps click here or head back up to the top of this article. If you are still unable to upload the file correctly, get in touch with us here. If you see the screen below, the file type you have tried to import may either be incorrect or corrupt. Double check that this file is a .csv file and reimport it.